This web page is a continuation from our Native Canadian History in Ottawa and Gatineau. I live in the Britannia area and am interested in what settlements existed prior to the arrival of the French. I read an early history of the Britannia area and there is only one page devoted to early history. would have put layers of frost on shelters. It is possible also that there were some settlements above the Deschenes rapids on the Quebec side, (Aylmer) or on both sides of the river? Thanks very much for your interesting e-mail regarding early native settlement in the Britannia area. and may be able to help us out. anything specific to early settlement at Britannia. Research Team: Sandra Diabo Decontie and James Odjick, 344 pages. mainly in the River Desert region at Maniwaki. We also have a brief web page at www.bytown.net/britannia.htm to which we could add new material. Barrhaven on its way towards the Rideau River and Manotick. It comes out near Chapman's Mills at Long Island. See www.bytown.net/longisl.htm for the location. where the Jock River enters into the Rideau - another spot to launch a canoe, these days. and could link your e-mail to our Algonquin page at www.bytown.net/nativehist.htm and also to our canoe routes web page. Another idea would be to speak to the Algonquin folk who are at Chaudiere Falls, on the Ontario side. I concur with Al Lewis. shores of the Ottawa River and, if anyone would have been in the neighbourhood, they would have been walking on snowshoes, not canoeing. in Algonquin Park that would be flowing south and east. Further north, they were sharing with the Nipissing (inter-marriages). inhabited as much as 1500 years ago. There was probably good fishing at the rapids near Carleton University. 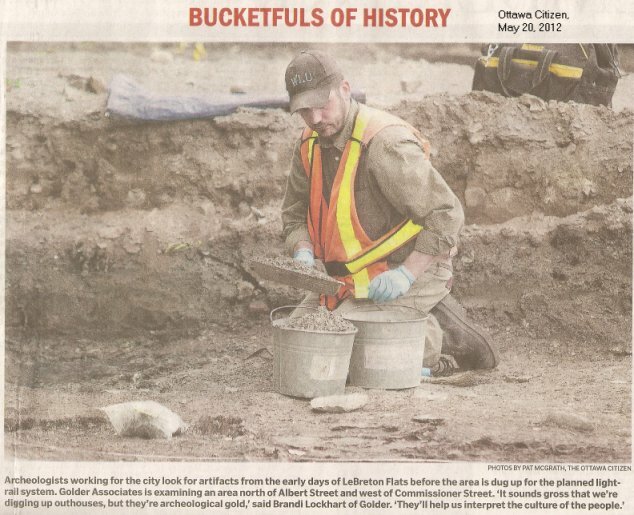 I do not know if archaeological searches were done at Britannia but you may want to check it out with the Ontario Archaeological Association. found any more..but, you never know! once again, nobody seems to know what happened to the bones or where they were found. game, knew their history, mothers and age and probably gave them names). They were very responsible hunters and only killed what was sufficient for their needs. Wish we could say that for our society now. from the Ottawa River to Black Rapids in 1814. I think this the road that Al Lewis is mentioning in his reply. Here is the Ottawa Chapter, Ontario Archaeological Association web site. To undertake any kind of archaeological field work in Ontario, the Ontario Heritage Act requires that a person hold a valid archaeological license. Archaeological organizations and associations  offer opportunities to help on licensed sites. The various OAS chapters are found at http://www.ontarioarchaeology.on.ca/chapters.php. third trip, I believe. He had brought 700 settlers with him. I wonder if any concerted archeaological digs were ever done for Philemon Wright's early settlement in Gatineau. Before Wright, there were french trading posts and settlers around Chats Falls and along the Lievre River. Robert Serre of the Gloucester Historical Society has done research about this. have also been done on the Quebec shore across from the town of Cumberland. The rapids at Carleton University are the Stegmann Rapids, named after Ottawa's very first surveyor who drowned there. By the way, there is an excellent paper regarding early Aboriginal agriculture in the upper headwaters of the Madawaska River. The area of the village of Pendleton in South Plantaganet Township is the site one of Eastern Ontario's archaeological finds. It is called the Lamoureux Site (BiFs-2) and is close to the Muldoon Site (BiFs-1). The reference to first nations people is strange to see in print. May be an occasion to round up what is being held privately in town to make a comprehensive collection. part of the rat species. There is an animal in the Brazilian jungle that belongs to the raccoon family. So much blah,blah,blah for now. See also Birchbark Canoes in Eastern Ontario and Western Quebec. building of Ottawa's Light Rail Transit system. Source: Ottawa Citizen, May 20, 2012. A good place to start with early First Nations archaelogy in the Ottawa area is the web site of the Canadian Museum of Civilization. explained according to the development of the academic disciplines of Archaeology, History, Anthropology and Ethnology. The Canadian Museum of History has some interesting research by Jean-Luc Pilon: Archaeological Mysteries of the Ottawa area.